I have been part of Basic Income Earth Network’s and US Basic Income Guarantee Network’s social media team for a while and I want to clarify something for as many readers as possible. There are three ways of looking at the basic income movement: Basic Income can be endorsed as a (1) proposal or (2) a project or (3) an idea. A lot of communication causes people to evaluate each other more harshly than they need to because they mistake where the speaker or writer is coming from. I will say what I mean and show how this distinction helps me. Alaska invests a small amount of the land rent it charges and puts out the dividend to every citizen. They give about $2,000 to every individual and $8,000 for a family of four. An interesting common feature of these three examples is that basic income was an afterthought for many supporters. These proposals are not parts of projects that seek to abolish poverty or secure independence for all. The Alaskan Governor at the time the dividend was implemented, Jay Hammond, was following the basic income movement and he sought a more substantial amount. Alaska, however, has never had a basic income movement. There has never been an attempt to push the grant all the way to a poverty-ending amount. 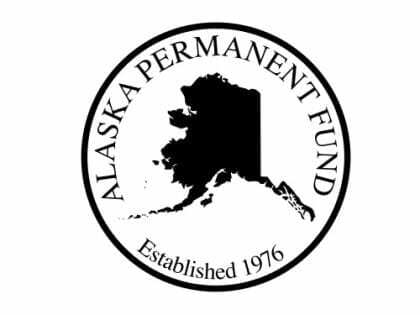 That said, at $2,000 a year for all family members, the Alaskan Permanent Fund raises the incomes of low-income families more than most other proposals out there. The dividends were largely an accidental product of the State’s Constitution, which gave un-owned land to the State. If power-brokers in Alaska had known that this land included some of the most lucrative oil reserves in the world, this would not have happened. Hammond’s commitment combined with these fortunate circumstances produced the Alaska Permanent Fund. Supporters of the Healthy Climate and Family Security Act are mainly trying to develop an answer to the threat of climate change. They understand that a cap on carbon would raise prices on fuel and other things that many low and moderate income people need. Some supporters are enthused about the dividend to be sure, but it is very seldom sold as a stepping stone for a dividend high enough to foster independence. Again, with that said, there are very few proposals that would result in an increase in average income of $1,000 in low-income communities. Fair Tax supporters are primarily focused on getting rid of the income tax. The dividend is seldom emphasized in their literature. When it comes to the impact on poverty, the math is more complex for this proposal, because the new sales tax would be high. Proponents do cite economists who stress that the Fair Tax would have a progressive impact. When Basic Income Earth Network or US Basic Income Guarantee Network links to an article describing a project like this, we get a lot of comments that evaluate them as if they were the entire basic income project. The proposal is treated like a project. We are informed that you cannot live on $2,000 a year. We know that. Many respondents “project” projects onto proposals. They don’t evaluate the proposal but an imagined series of other proposals that would stem from an imputed project. When Silicon Valley investors start a basic income pilot, we are told that they want to cut this and that. But they have not said so, and we will not know their project until they start making concrete demands. Lots of media presume that a basic income replaces all other social provisions, which is a view that I have only rarely encountered in my time with engaged members of USBIG and BIEN. We hear a lot of false news that Holland or Finland is replacing everything with BI. Projects are being foisted onto proposals and policies. Keep in mind that a basic income may well be implemented as an afterthought or as a part of a project that most anti-poverty activists oppose. Charles Murray’s proposal would consist of $10,000 per person and a $3,000 health care voucher. This would replace everything that currently promotes social protection. When he emphasizes the amount of money this would save, that includes bureaucratic expenses, but that also entails a huge withdrawal of other expenses, such as social provisions that many anti-poverty activities would rather keep . While we should not endorse a bill that implemented Murray’s proposal, we can acknowledge the grant is a good idea if it is not accompanied with harmful cuts. If such a basic income were to be implemented (and Paul Ryan has expressed an interest in consolidating anti-poverty provisions), those who support BI as part of an anti-poverty project will have to fight to keep the grant and raise it. We have to talk about basic income now so that anti-poverty activists do not oppose it. (2) Basic Income as Project: Once a basic income is part of a project, we have to look at what the whole project seeks to do. Many of the supporters of basic income pilots in Finland also support austerity as the right response to the European financial crisis. Almost everyone involved with Basic Income Earth Network and its affiliates are opposed to austerity. They see basic income as a way to combat poverty directly, with less bureaucracy and more security for most citizens. Many supporters of basic income in Finland are working to make sure the pilots are an opportunity to push basic income as emancipatory . How it is funded, what is cut, what is not cut—all of these factors turn a policy item (an unconditional cash grant) into a project. We have to learn how to assess whole projects. Left-wing organizations should make a basic income part of their left-wing project. Left-wingers that denounce basic income as “neo-liberal” are refusing to de-link the policy from a rival project. They should write out what sorts of basic income they would support and condemn the powers-that-be for not securing economic independence for all. Free-market enthusiasts (I am not calling them “right-wing”) should make a basic income part of their free-market project. Those that denounce a basic income as “socialist” or “communist” are refusing to de-link the policy from a rival project. They need basic income if they care about extending the benefits of markets to everyone. In the US, there are no left-wing or free-market organizations (or magazines or parties) that have stated clearly whether or not basic income is part of their project. My hypothetical left-wingers and free-marketers are based on reading a few thousand Facebook comments and individual columnists. De-linking the proposal from the project can be difficult. Would an otherwise free-market-oriented economist with a basic income in the mix still be “left-wing”? Is basic income such a good policy that we should support someone who supports a rival project? Some people are suspect of an Alaska-style dividend just because they know the state usually votes Republican. These are the sort of choices we will face. If a supporter of a rival project embraces basic income, one has to decide whether or not to jump ship. Some basic income supporters will want to work within other projects. Some will work within the Greens or within Socialist or Labor or Environmental organizations. Others might name a particular bill and lobby for it. Basic Income Action in the US has stated that they seek any unconditional grant that leaves the least-well-off and the majority with more income than before. They have lobbied for the Healthy Climate and Family Security Act and hope to get a bill sponsored that has a full-fledged basic income in mind. BIA argues that this project improves any other project. Whether they are the left or the right, whether they have a good tax plan or a bad one in mind, they would be that much better with a basic income in the mix. See them at www.basicincomeaction.org. 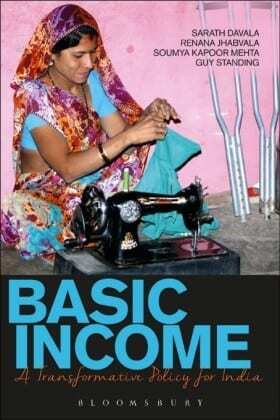 (3) Basic Income as Idea: There is another way to think about basic income. This is an idea that gets in your head. Once you realize that it is mostly a question of political will, you start to think about how different the world would be if everyone had a share. You start to wonder how different schools would be. How different political life would be. How different the art world and the sport world would be. When I first heard about basic income, I was excited because I saw it getting to people who need it. I had seen the manipulation of money and power deny the invisible and the powerless the resources they need. Too many times I saw “jobs programs” pretend to hire “everyone who sought work.” Sports arenas and lectures were sold as anti-poverty programs. A basic income gets around all that. Now, I think more about how much more powerful low-income communities will be. And I see better the work they are already doing. Sarath Davala, Renana Jhabvala, Soumya Kapoor Mehta, and Guy Standing organized a pilot program in India and wrote a book that testifies to its emancipatory effects. A video they made provides a nice synopsis. One sees here an image of strong people made more powerful. I see the same impact in low-income parts of the US. Basic income gets around the pretending so many people do when they approach poverty. I wrote a piece on how a basic income could work in the Saint Louis/Ferguson area that has this sort of emancipation in mind. One of my main goals was to get readers to just see what a difference more income would make. We should spare them the hectoring about each and every choice they make and issue a share. The Swiss Basic Income Movement mostly sought to push basic income as an idea in Switzerland but also all over the world. 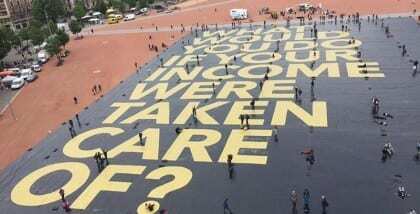 History’s largest poster posed the question: What Would You Do If Your Income Were Taken Care Of? They posed it in English and reassembled the poster in Berlin . 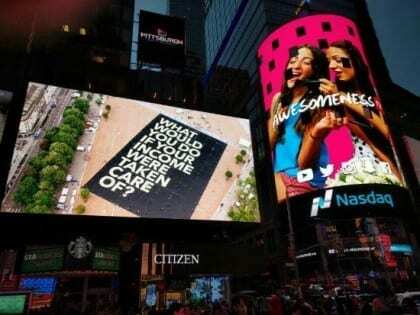 A picture of the poster was shown in Times Square. They are posing a question to the world. The movement has pushed people to think about what makes a life and a society good. Long before basic income becomes a policy, it does great work as an idea. Another example is the Canadian Association of Sexual Assault Centres. Their shelters talk with residents about basic income. They have a copy of the Pictou Statement they wrote in which they proclaim their support for basic income. Publicly endorsing basic income offers a chance for different relationships between people. When a shelter tells someone fleeing assault that they want a different allocation of resources, this breaks the long chain of bureaucrats, landlords, advisors, and hustlers. When I tell someone that I think they deserve a share, I have a chance to show that I recognize them as valuable. That is a powerful idea. I have also found that people who are not sure they believe basic income is feasible politically end up pointing to other social provisions that they consider more efficient or politically feasible. They start to talk about education and health and public employment. This is a far better conversation than one that argues between some provisions and no provisions, which is the one we are hearing far too often. That is a powerful idea. A lot of people have seen police violence, corruption, and the privileged position of the wealthy, and they just can’t imagine a government that macro-manages and micro-manages a just economy. However, they have seen Social Security issue a check to everyone and they have seen the IRS tax forms issue an exemption. They know that this proposal is simple enough for even a bureaucratic government to implement. That makes this a powerful idea. What if people could direct their BI to those that had special needs. Not return it to government but send it to GoFundMe or equivalent. Fairtax plus BI with GoFundMe option would be powerful.